I love this time of year where I can see all sorts of things bloom when I walk around the yard. I'm not sure what the season is where you are, but is anything blooming where you live? Highlight the link, right click, click "go to link"
Your photo links are not working at the moment. 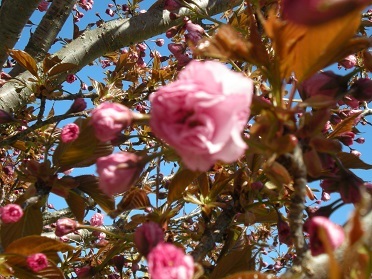 We have some buds on our cherry tree at the moment but not much else is obvious in bloom or budding at the moment. The cold clung to long so things are slow to waking-up. We do have some things blooming but I don't know what all of them are called. We have some Easter Lilies though. Photobucket isn't working. Imgur isn't working. Tinypic is rotating my photos. What the heck? Edit: I think I have it working now. This was my attempt of editing a photo of past years cherry blossoms. I made it smaller did you edit any of your photos up there? So I edit the image in file instead of on imgur. that seemed to work better since the imgur file name got a weird ? in it that I think is effecting showing the file. This is some cherry blossoms from 2013. Such pretty flowers Riley and Hanahime! Riley you have a lovely variety of flowers. You're so lucky. I miss having a lilac bush. Best smell in the world. Hanahime - Cherry blossoms are so pretty! No, I didn't edit any of my photos. Rayven - I had a couple of trees that bloomed, but the flowers are all gone and there are only leaves now. I should have taken pictures. Next year. My parents have a lilac bush, and I was trying to find one to plant at my old house, but I couldn't find the one I was looking for. Just so happens that there is the same type of lilac bush at this house as there is at my parent's house. We just ordered a lilac tree because they didn't have any bushes. It hasn't came yet. I hope it still smells the same. Then it's odd it didn't work. I never knew there was a lilac tree. We also have some hydrangeas in the front but they still have a few months before they bloom. It always seems to be rainy when I come to check in so I can never get pictures of the growing flowers in our yard. Hanahime I didn't either. I believe it was called a Persian Lilac tree. Yeah it does. I just hope it smells the same. I grew up with Lilac bushes, but they died. My brother and my son were close in age and I think they played with them too much when they were little. I used to look forward to them blooming every year. I could smell them all day long. Honeysuckle too. Speaking of which, I wish they'd hurry up and get here. I can't wait to see all of the things we ordered. I'm not sure I'm looking forward to planting them though. Lots of work! The second one I've had for years, and this is the first time it's bloomed. I was beginning to thing it was just never going to bloom at all, and I had forgotten what color it was. Those are beautiful Riley! I especially love the dark purple ones. We have some orange ones, and maybe another color. I can't remember. I had forgotten their name. We call them Flags. Oohh, orange irises sound pretty! I just bought a rose bush to add to the existing rose garden. I seem to be attracted to warm color roses, even though I love them all. I ended up buying a light orange one. And it will be interesting to see the rose garden when everything blooms. Right now, there are no roses, so I have no idea what color any of them are.